With this post I 'm starting my own series of monthly favourites. I 've debated whether or not to make these kinds of posts, since almost everyone does them around this time of month, but figured "why not? ", after all, I do love reading (and watching) about products that were well loved and used - gives you a sense of what actually works, doesn't it? 1. Frédéric Fekkai Shea Butter Hair Mask. Being fed up with my dry frizzy hair in the past few months and totally inspired by the hair product twittertalk, I decided to change my haircare. I 've been using this mask as a weekly treatment as well as a couple of products from Kerastase's Resistance range, and dare to say that I have noticed a difference: my ends aren't as dry, my hair is much less frizzy and a tiiiny bit softer. Will continue to use this product, but fairly sure it has helped my poor hair! 2. OPI "Bullish on OPI". No introduction necessary, check my OPI post and you 'll know why I love it so much! 3. MAC Assemblage quad. Yeah, the glitter is flaky and not the easiest product to work with, but that rusty orange colour in the quad is so beautiful! I 've been using that colour on the inner half of the lid and I love it - makes the eyes really stand out and it's such a pretty colour for fall! 4. Estee Lauder Tea Bisquit paired with MAC Buckwheat. EL Tea Bisquit is one colour I keep repurchasing, as it's exactly my skin tone. Every time I want to look like I 'm not wearing any eyeshadow, this is what I go for: it covers any redness or small veins without a lot of effort or need for precision. This month, I 've been pairing it with MAC Buckwheat as a crease colour. The effect is a subtle brown smokey eye, perfect for everyday wear! 5. Maybelline Dream Mousse Blush in Dolly Pink. A gorgeous pink shade that I wore the most this month. Guaranteed the shimmery nature of this product is not for everyone, but I love that it adds a perfect glow - no highlighter necessary! I 've been applying it with my 188 brush for an even finish. So, that was it for my favourites this month! Love that you are doing this as I really enjoy reading these kinds of posts. I havent yet bought the dream moose, bit thanks for the post. I keep ummin and ahhing about it! You should keep on posting about your months favorites!!! Where did u get the hair mask?Sounds interesting. I use Maybelline Dream Mousse for several years now and I love it! Great post! It's a great idea to do this type of post :) I love watching monthly favourites videos so naturally I loved this! I may have to start doing them as well. 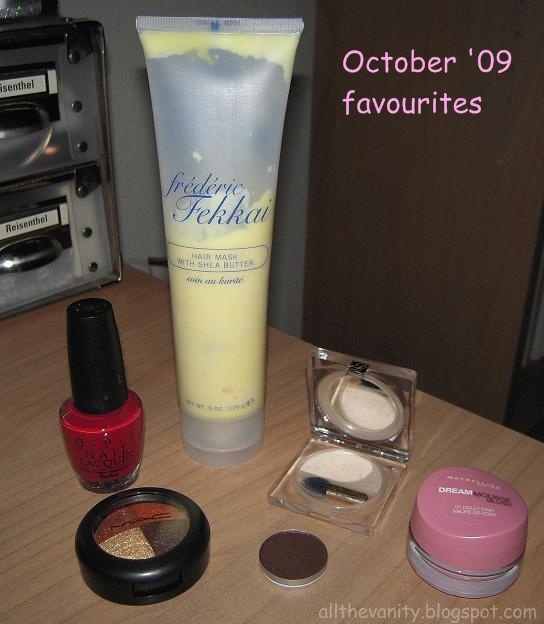 I need to try that Fekkai mask once my L'Oreal mask is finished..
ohhhh dolly pink is really pretty! I love that FF Shea butter, I actualy use as a leave in conditioner too, very small amount goes a long way. Is the same price here, Aveda Damage Remedy Intensive Restructurant Treatment, is just fab, my hall grail thing. Tea biscuit looks interesting. So does the nail polish. I need to make a mental note to check those out asap! Great practical faves honey keep em comin! @Jo: Tea Bisquit is one of my fav eyeshadows of all times, not sure if it would be to everyone's taste, but it's been a savior to me in many occasions! @lydi: Thanx love, I will, and so should you (I 'm totally in love with Erika F since you posted about it btw)!!! @Sandra: Definitely definitely definitely start doing these! They are surprisingly easy to make - talking about a product you love comes naturally! Which L'Oreal mask are you using at the moment and does it condition moisturize your hair? @Karen: Definitely give it a try, I have the full size tube, but there's a smaller one available too! All of those products worked for me this month, hope they work for you as well!